“Calamity Cottage” is the perfect vacation home located in the exclusive gated community of the “Great Abaco Club” with direct access to the Sea of Abaco, one of the world's finest cruising and fishing grounds. World Class Fishing tournaments are held here and Boat Harbour is the largest Marina in the Out Islands. Our “Family & Boat Friendly” home is a great place to escape too, relax and enjoy the best of the Abacos. After a great day of island activities enjoy our beautifully decorated home. The main house has 3 Bedrooms/3 bathrooms ( 2 King Rooms & 1 with twin beds). A private guest suite is just off the courtyard with its own entrance. The guest suite includes a Queen bed, walk-in closet & bath. “Calamity Cottage” also has a private dock which will accommodate up to a 55’ vessel with water and 50 amp service as well as a great place to work on that tan. Prepare your “Catch of the day” in our modern fully equipped kitchen or outdoors on the gas grill. While dinner is cooking enjoy the “Futch Hut” bar where it’s always 5 O’clock! Serve dinner in the dining room which seats 8. Our great room looks out on the water and is so comfy. Abaco has so much to offer you for a great vacation! Fishing, diving, snorkeling, golf, shopping and site seeing are just a few of the activities on this fabulous island. Local restaurants and bars provide great food as well as wonderful entertainment. Island hopping is a great adventure you just have to try. Taxis and ferries are easily accessible and can get you where you want to go. Boats, golf carts and bikes can also be rented on the island. Abaco is THE PREMIER DESTINATION in the Bahamas. This is the place to come for the authentic Bahamas lifestyle. Less than 165 miles from the Florida coast in some of the most beautiful waters anywhere! Shallow sandy flats to deep offshore waters allows the greatest fishing experience anywhere! Wahoo, kingfish, grouper, tuna, bonefish, dolphin, white and blue marlin can be yours! Bring your own boat or charter with some of the greatest skippers around. This roomy house can be a wonderful place for a large group or family. We love to entertain our family and friends and its always a great time for all. So come and enjoy our piece of paradise! The inlet is a 10 minute Boat ride away. Great Abaco Club is located through the gates of Boat Harbour & Abaco Beach Resort which is adjacent to it. Just off the Sea of Abaco is a protected water way entry into Great Abaco Club Marina. This home sits on a waterfront lot. Park your boat in the back yard and enjoy shaded afternoons on the deck. My husband and I stayed at Calamity Cottage for a week in the summer, along with three other couples. It was wonderful. The home is absolutely beautiful with very quick and easy access to the ocean. The pictures truly do not do it justice! The location allows for a fairly short walk to shops and restaurants. 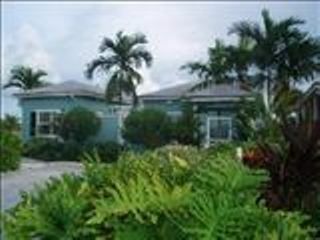 I would highly recommend this home to anyone looking to vacation in the Bahamas! Secondly RENT a BOAT!!! our family had the BEST time EVER visiting the islands. ..
Tilloo Banks to find sand dollars @ low tide. So amazing to find these!! Tahiti Beach- good place just to hang out. Man-O-War visit the sail shop & Penny the sea turtle. Also found the most starfish on the point . Just make sure to keep them in the water! Guana Cay lunch & drinks @ Nippers. Lubbers Quarters ate at Cracker P's-Caesar salad was really good. We rented our boat from Rainbow Rentals- Tracy & Yvonne & took really good care of us. We will use them again! C.C. was GREAT & would stay there again! Hope our review helps you!